This post was sponsored by Align as part of an Influencer Activation for Influence Central, and all opinions expressed in my post are my own. Digestive health isn't something we think about until we think there is a problem. But whether you have a healthy digestive system or not there are times when your system can get thrown for a loop and for kids that can happen even easier. Having a healthy digestive system keeps everything moving and flowing the way it should. Replenishing and making sure we have enough good bacteria in our guts to promote better health. This is vital for a healthy digestive system. The kids and I take a daily probiotic to help prevent problems and to stay at this optimal level. Snag your $5 off coupon for Align Jr. here. Diet Changes – Have you glanced at a kids menu lately? Chicken fingers, hot dogs, cheeseburgers, pizza, and macaroni and cheese. I think we have the friend food category covered! While eating out may seem like a special treat, kids tend to eat crap when they go. The only vegetable offered sometimes are the french fries. Eating greens help keep a healthy digestion system going. Leafy greens are one of the best. High fiber options are what you want to look for. Apples are another great source. Stress – While we hate to think of our kids as being stressed out, it does occur. Changes in routine and times of crisis are the perfect example. This can cause problems with digestive health. Illness – When we get sick around the house there may be some antibiotics and cold medicine that is taken. These kill the good bacteria along with the bad so it's important that you're putting probiotics back into their system. Lack of Exercise – With recess being cut shorter every day and screen time becoming longer, kids aren't getting a lot of much-needed exercise. This keeps their hearts pumping and their circulation going. All things that can help the digestive system along. When Traveling – When we travel, almost everything I mentioned above can occur. Go to a new country and your family is exposed to all new flora and fauna. New foods and maybe even some not so good water. This is the #1 time to keep your probiotics handy. 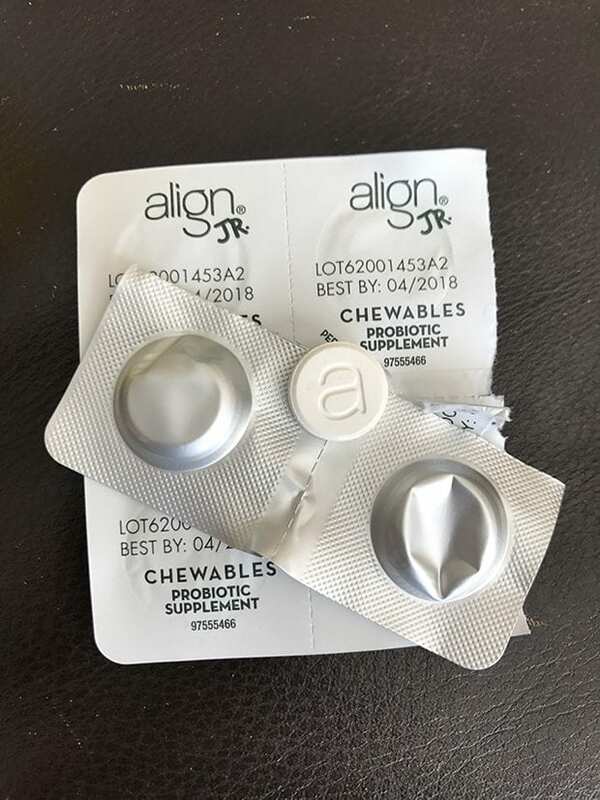 Align now makes an easy to chew probiotic for kids! Align Jr. is the #1 Doctor and Gastroenterologist-recommended probiotic brand‡ and designed for children ages 6-12 years of age. As a mentioned before, we take probiotics daily, so we are never faced with digestive issues from some of the things I listed above. Align uses Bifidobacterium infantis 35624, a unique natural probiotic strain for kids or adults that’s not available in any other probiotic product, including store brands. 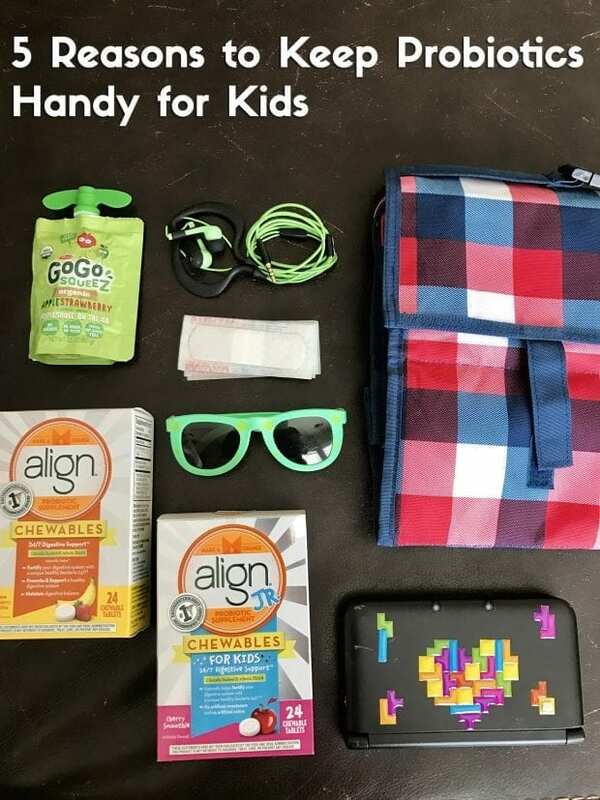 The Align Jr. tablets are chewable and cherry flavored! 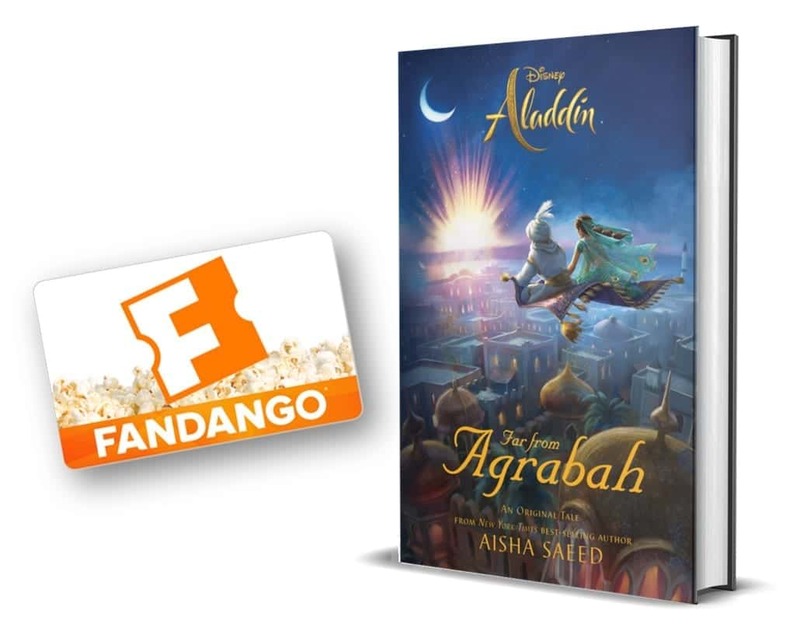 Snag your $5 off coupon here. We have to carry them as adults when we travel, too! Different climates plus different foods plus less water = cranky tummies!